A recent summary judgment decision from the Second Department of the New York Appellate Division shows how complex it can be to prove liability in the case of a multi-car accident, and how critical it is to find an attorney who understands the value of thorough factual investigation and evidence gathering. The Second Department covers Staten Island (Richmond), Brooklyn (Kings) and Queens, Nassau and Suffolk counties, among others. The case in question, Hartfield v. Seenarraine, is based on a four-car accident. The plaintiff, Roxanne Hartfield, was driving the lead car and received serious injuries when she was hit from behind by the car driven by defendant Cindy Ragbeer, and owned by defendant Kawalpattie Shiwdas. Hartfield filed a lawsuit against Ragbeer and Shiwdas, among other parties, for the injuries she received. Ragbeer argued that she had not been negligent in causing the accident, because her car was itself hit from behind, forcing her car into Hartfield’s vehicle. The defendants filed a motion for summary judgment of the plaintiff’s claims, based on Ragbeer’s assertion that she was not negligent. Generally speaking, when a car accident occurs, the injured victim has to take active steps to prove the reasons why another driver was responsible for their injuries. Rear-end accidents are an exception to this rule. In New York, instead of the plaintiff being required to show that the rear driver was at fault, courts will presume that any rear-end accident with a stopped lead vehicle is the result of the rear vehicle driver’s negligence, unless that driver can prove otherwise. 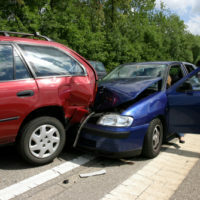 The driver must present some other evidence-supported explanation to the court for why they hit the front car, and the explanation that they were also struck from the rear by a different car is often the explanation. Here, the court ruled that the defendants had not overcome the presumption that Ragbeer’s negligence had caused the accident. While Ragbeer had argued that she was struck from behind and forced into Hartfield’s car, she had failed to support this argument with sufficient admissible evidence. Ragbeer failed to submit a sworn affidavit describing the way in which her car was forced into Hartfield’s, did not undergo a deposition that would have provided sworn testimony in support of her argument, and had her version of events challenged by the testimony of both the plaintiff and another defendant. Ragbeer cited to the police report generated in this case which included a statement from an unnamed witness that another car hit the one driven by Ragbeer. However, the court ruled that, since the witness was not named in the report and thus could not be contacted to testify under oath in a hearing or at trial, the statement was considered hearsay, and could not be considered. The defendants will have another opportunity to prove that the accident was caused by a third party when the case goes to trial, provided that the defendants do not first attempt to settle the plaintiff’s claims. This case is an example of why it’s so important to find finding a diligent, knowledgeable attorney to represent you in a multi-car accident. Since multiple cars are involved, the potential causes of the crash multiply exponentially. Any one of those drivers may have been distracted by their phone, intoxicated, speeding, or otherwise driving negligently. Only an expert factual investigation could uncover all potential sources of negligence and liability at work. While it is still unclear from the record whether or not Ragbeer was ultimately responsible for the accident, it is entirely possible that if her attorneys had presented sworn testimony from Ragbeer, located the witness who was anonymously cited in the police report, or found additional witnesses who could describe what happened under oath, then the defendant may have been able to show that she was not ultimately responsible. Seek legal counsel with the trial experience and determination to offer you complete and thorough representation in your New York car accident case. If you’ve been injured in a crash in New York, contact the dedicated and determined personal injury attorney Leandros A. Vrionedes for a consultation on your case, in Manhattan at 212-889-9362, and in Queens at 718-777-5895.